While viewing a user's profile, I found that the next tag badge being tracked is the bronze 👾 badge. There is not even a 👾 badge, and I don't understand how or why this is possible. So, uhh, what's the deal with this? Is it intentional behavior? Non-existent tag names that were previously set have been left unmodified (for now). The system still allows you to track a tag that has not reached the 100-question threshold to have a real tag badge. This answer provides the method of how this used to be achieved and how it used to work. Sadly, this has been fixed now. See Jeremy’s answer. I’ve also tried to manipulate the POST request directly but had no success in changing the tracked badge. Not the answer you're looking for? Browse other questions tagged bug status-completed tags tag-badges . Can I haz stinkin' silver tag badge, plz? Tag badge not awarded due to merged answer? 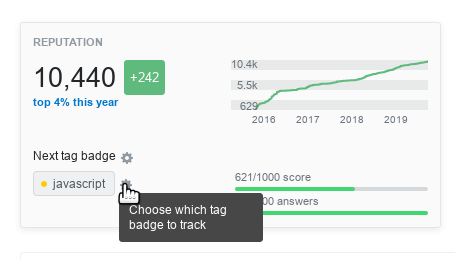 How many users earned a tag badge before me?